Heather Elizabeth Langenkamp is a 5' 3" (1.6 m) American composer, makeup artist, director, producer and TV and movie actress. She was on born July 17, 1964 in Tulsa, Oklahoma, USA. 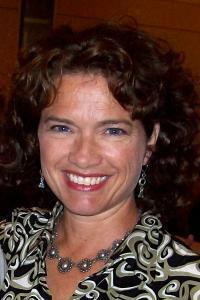 She is also known as Heather Langenkamp-Anderson. Her mother Mary Alice is an artist, and her father Robert Dobie is a petroleum attorney. Her father served as Deputy Assistant Secretary of Energy in the Carter Administration, the Clinton Administration and as Director of the National Energy & Environmental Law & Policy Institute of the University of Tulsa College of Law. Heather has English, German and Scottish ancestry. Heather is the eldest sister of three siblings. Her brother Matthew Langenkamp was born in 1967 and works in Hong Kong. Her sister Daniel Langenkamp was born in 1969 and was a graduate student matriculating in Pakistan in 2001. Her sister Lucy Langenkamp was born in 1975 and studied art in Tibet in 2001. Heather went to Booker T. Washington High School and graduated in 1982. She attended Stanford University and received an English degree which took her seven years to get because of her work schedule. She also graduated from an all girls school, National Cathedral School for Girls in Washington, D.C. Her first acting part in a movie was in Francis Ford Coppola's The Outsiders (1983) which was filmed in Tulsa, her hometown. Heather married Alan Pasqua on March 16, 1985 and divorced him in 1987. Heather and Alan have no children together. Heather married David LeRoy Anderson in 1990, and they have two children together. Their son David Atticus Anderson was born on May 24, 1991 and daughter Isabelle Eve Anderson was born on December 24, 1994. Heather and her husband David owns AFX Studio, which is a Special F/X Make-Up Studio located in Panorama City, California. David and Charlie Sheen were friends since high school, and Sheen was the best man at David’s wedding to Heather. She was also the owner of The Malibu Gum Factory, which sold chewing gums with trading cards of local surfers packaged in them. Heather and her family live in Malibu, California. Heather loves to take photographs and is an avid photographer. Heather is famous for playing Nancy Thompson on the A Nightmare on Elm Street series and for playing Marie Lubbock on TV series Just the Ten of Us. She was the executive producer and narrator for the documentary Never Sleep Again: The Elm Street Legacy. Wes Craven's New Nightmare is based on many elements of an incident where Heather was stalked by a fan. She also played housewives with Shelley Fabares, who solved mysteries in Suburban Beat (1985). Her first-feature part in a movie was in 1984, Nickel Mountain. She leads a local beach clean up group and is a PTA member. She was the makeup artist for Cinderella Man (2005), Evan Almighty (2007), The Cabin in the Woods (2012) and Star Trek Into Darkness (2013). She was ranked #6 on the "Hottest Women of Horror Movies" list in Maxim Magazine. Heather played Nancy Kerrigan in Tonya & Nancy: The Inside Story (1994) and she also resembles Nancy in real life.